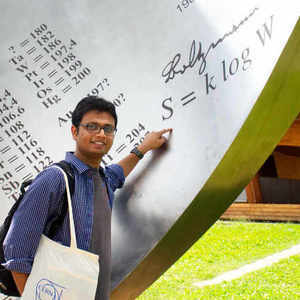 Materials scientists are constantly exploring and evaluating new materials and their properties for energy and electronics devices. A key aspect of this exploration involves finding meaningful descriptors that can aid and accelerate this process — this approach is popularly known as material-by-design. In our Nature Communications article, we first demonstrate that many metal/ceramic interfaces present in the solid-state devices for numerous technologies are high-diffusivity or "short-circuit" diffusion paths, and then propose an empirical descriptor to aid material design involving these interface systems. Whether it is addressing the pressing challenge of extending the Moore's law: to keep producing semiconductor chips that perform much faster than their predecessors, or the ever-critical need to supplement our energy needs; there is a continual search for new materials and associated phenomena to advance such technologies. Solid-state devices for these applications, e.g. all-solid-state batteries (ASSB) and complementary metal-oxide-semiconductor (CMOS) devices, are composed of numerous interfaces between the metals and the ceramics that constitute them. In our paper, published in Nature Communications, we examine several metal/ceramic interfaces and investigate the interface diffusion that occurs along these interfaces. Our findings suggest that this interface diffusion can be extremely fast, and hence crucial to reliability and performance of solid-state devices. The motivation for this study stemmed from the observations in the group of Eugen Rabkin (coauthor) at Technion-Israel Institute of Technology, where they observed the formation of through-thickness holes in annealed thin Ni-films deposited on sapphire (alumina). Bizzarely, only half of the total Ni disappearing into these holes could be accounted for — in the form of rims that formed around some of these holes. Could it be possible that the unaccounted Ni would move down along its grain boundaries and then redistribute along the metal/ceramic interface (Ni/sapphire)? In the paper, we use continuum modeling of simultaneous grain-boundary, surface and interface diffusion to show that this is indeed the case. Interestingly, the metal/ceramic interface diffusion can be as fast as the grain-boundary diffusion — another high-diffusivity channel. This may seem counter-intuitive at first, since the strong metal-oxygen bonds at this interface would be expected to slow down the diffusion. So how exactly does this transport occur? The usual suspects are the point defects in the vicinity of the interface. 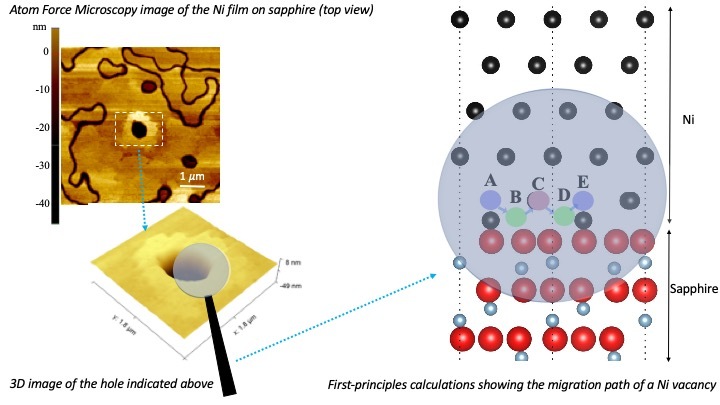 Specifically, our first-principles calculations show that the Ni vacancy formation and migration energies are much lower at the Ni/sapphire interface than their corresponding values in bulk Ni. Why is this? Is this a general trend? It took us a few weeks to arrive at the answers to these questions— multiple discussions over sufficient cups of coffee. In the end, the answer came out to be a straightforward argument for the adhesion behavior of the metal and the ceramic; in other words, the wetting characteristics of the metal on the oxide/ceramic. Strong wetting between the metal/ceramic pair suggests a sluggish interface transport — relative to bulk metal diffusion, whereas the case where the metal weakly wets the ceramic (e.g. Ni/sapphire) the diffusion can be extremely fast. In addition to the Ni/sapphire interface, we examine several other metal/ceramic pairs and propose an empirical descriptor that predicts whether a given metal/ceramic pair will exhibit rapid or sluggish diffusion. If you are working (or plan to work) with metal/ceramic interfaces, we hope that you will find our paper anomalously useful.